Sawsbuck Spring in game: 489 Who? Important notice! 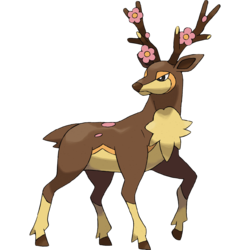 Pokemon Sawsbuck Spring is a fictional character of humans. Sawsbuck (Japanese: ????? Mebukijika) is a dual-type Normal/Grass Pokémon introduced in Generation V.
It evolves from Deerling starting at level 34. 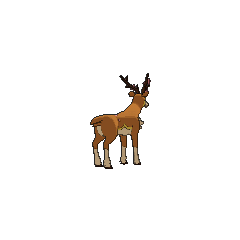 In Generation V, Sawsbuck changes its appearance depending on the current season. However, this change in form does not occur after capture, unless it is present in the player's party at the time of a season change. This applies to Eggs as well. 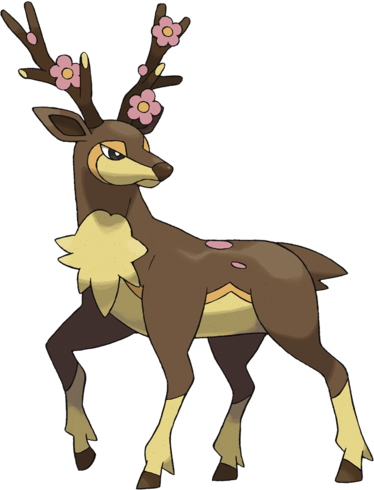 In Generation VI, Sawsbuck is only encountered and caught in its Spring Form. The other forms are available if imported in from Generation V.
Sawsbuck is a brown and cream deer-like Pokémon with rhomboid ears and darker ear insides. Its eyes have light-orange markings that curve down to sides of its face. It has a dark-brown nose, and it sports cream fur on its chin and sides of its face. Light-orange stripes rim its underbelly, and its back is decorated with spots corresponding to the season: pink in spring, green in summer, orange in fall, and white in winter. Its limbs are slender and tipped with hooves. Unless it's summer, its brown tail points down. Sawsbuck lives in herds led by the Sawsbuck with the most splendid antlers. It can live almost anywhere as they adapt to the season, but prefer to live away from humans. It is herbivorous. Its appearance changes depending on the season. During the spring, a tuft of cream fur appears on its chest, and its antlers are adorned with pink flowers. During the summer, its tail points up, it grows tufts of fur on the back of its head, and its antlers sport green leaves. 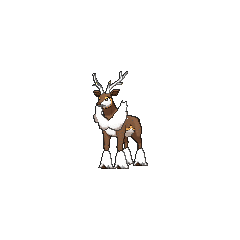 During the fall, it sports a cream tuft of fur on its chest, and the leaves on its antlers are red and brown. During the winter, the cream fur turns white, tufts of white fur appear on its chest and lower limbs, and its antlers are coated in white. Burgundy used her Spring Form Sawsbuck to battle Cilan's Pansage in A Connoisseur's Revenge!, but lost after being hit by a powerful Solar Beam. All four forms of Sawsbuck appeared in The Four Seasons of Sawsbuck!. 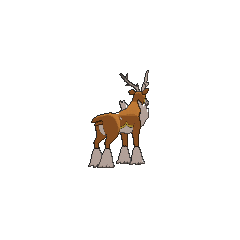 Two Summer Form Sawsbuck also appeared in Genesect and the Legend Awakened, helping to put a fire out at Pokémon Hills. Summer Form Sawsbuck appeared in both White—Victini and Zekrom and Black—Victini and Reshiram while Autumn Form Sawsbuck appeared in Black—Victini and Reshiram. Multiple Sawsbuck appeared in Stopping the Rage of Legends! Part 1 and Stopping the Rage of Legends! Part 2. A Summer Form Sawsbuck owned by Cassie appeared in Jostling for the Junior Cup! participating in the Pokémon World Tournament Junior Cup. 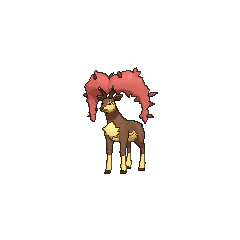 A Summer Form Sawsbuck appeared in Ash and N: A Clash of Ideals!. A Summer Form Sawsbuck appeared in Mewtwo — Prologue to Awakening. 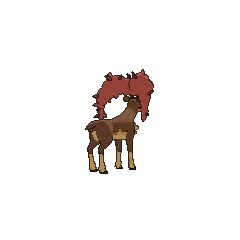 A photo of Summer Form Sawsbuck appeared in Mending a Broken Spirit!. 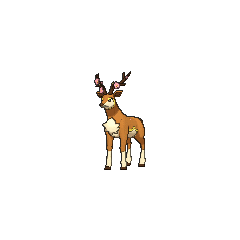 BW019 Sawsbuck Ash's Pokédex Sawsbuck, the Season Pokémon, and the evolved form of Deerling. The plants on Sawsbuck's horns change depending on the time of year, and people often use them to measure the passing of the seasons. In PS534, several Autumn Form Sawsbuck were used by a choir. 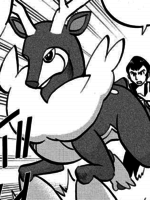 In PAORAS15, Norman owns a Winter Form Sawsbuck. It was first used to break into the Pokémon Association's old research facility. They migrate according to seasons, so some people call Sawsbuck the harbingers of spring. Moves marked with a superscript game abbreviation can only be bred onto Sawsbuck in that game. He is serious and grounded. He visited the Arcane Area, because his friends encouraged him to have a trip to relax. Now he likes it and lives there. For other sprites and images, please see Sawsbuck images on the Bulbagarden Archives. 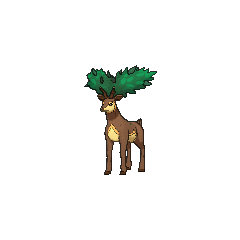 No other Pokémon has the same type combination as Sawsbuck and its pre-evolution, Deerling. Sawsbuck may be based on a Père David's deer, which is a species of deer that decorates its antlers with foliage during the breeding season. Its antlers may also be based on a deciduous tree. It may also be based on one of the stories of Baron Münchhausen, in which he tries to shoot a stag using cherry pits in his musket. The stag survives and escapes, and the next year he discovers a stag with a cherry tree growing out of its head. Sawsbuck is derived from sawbuck (a device for holding rough wood so that it may be sawn) and may be a combination of sawbuck and buck (male deer). Saws may also be an acronym for the names of the seasons (summer, autumn, winter, and spring). Mebukijika may be a combination of ??? mebuki (to bud) and ? shika (deer).